It's the encore that no one demanded. Chicago Police Department beat 1924, which covers the center of Wrigleyville + Boystown from Belmont to Addison and Southport to Halsted, has soared back to the top of the city's most robbery-plagued police beats. Out of 274 beats that divide Chicago into police patrol areas, 1924 now ranks #2 for robberies in the city over the past 90 days—up from a position in the mid-40's as recently as June 2. That's according to data from the Chicago Police Department's CLEARMap site. green are the ten best. Since the CLEARMap site's data is delayed by one week, the results of this past weekend's robbery spree will not be factored in until next Monday, July 14th, when the beat will very likely pop into first place. 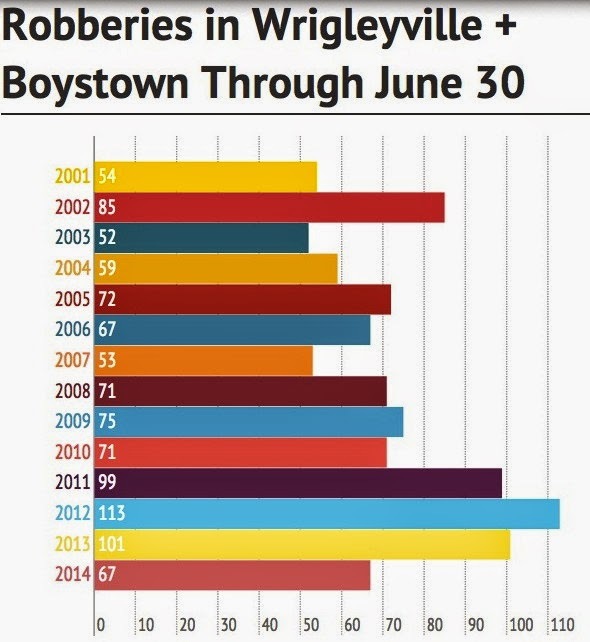 robberies so far this year than in any year since 2007. 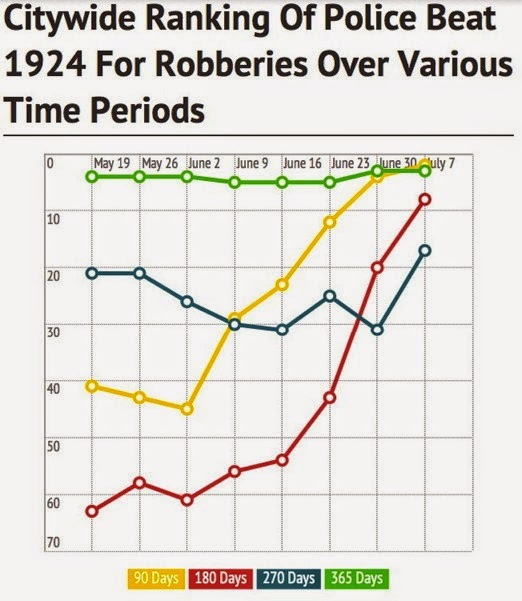 Indeed, had the department exercised control over Belmont Avenue, the annual improvement could have been closer to 50% and beat 1924 would likely rank in the mid-20's for robberies instead of sitting at #2. The weeks ahead are crucial as the return of summer brings along peak season for street crime. If officials don't want to squander this year's gains, a reclamation of Belmont Avenue must be placed at the top of their to-do list. Historical robbery data is mined from the city of Chicago Data Portal. 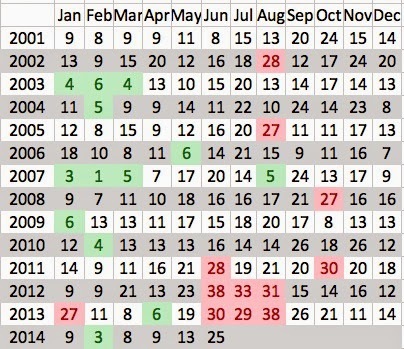 Beat rankings are recorded every Monday from data posted on the Chicago Police Department's CLEARMap site. The city of Chicago merged two police districts to form the current 19th police district in March 2012. At the same time, the police department redrew the boundaries of the district's police beats. Police beats are separated by the yellow lines that run down the middle of certain streets and it is impossible to know with certainty which side of current border streets crimes occurred on before March 2012. In order to maintain consistent comparisons across pre- and post-merger years, CWB includes crimes reported on BOTH sides of the current beat's border streets in all historical statistics. As a result, our crime counts for post-merger months may vary slightly from official city statistics.